At the Chittenden Regional Correctional Facility, we have a few different jobs. One is facilitator, one is writing instructor, and another is a support figure. We hope, when we go in an share our experiences through writing, that writers and facilitators alike get a sense of calm and a needed break from the prison environment and/or the business of our lives. We also hope that they skills we practice in group are practices we take out of group and use to take care of ourselves when we’re not together. This week, we welcomed my mother and certified Zen Tangle instructor, Catherine Reynolds into our circle to share her skills with us. Zen Tangle is a meditative drawing practice originated by artist and buddhist practitioner Maria Thomas and Rick Roberts. The practice uses repetitive patterns to create woven images. The process is equally as important as the product – an often beautiful, black and white, pen and ink, nonrepresentational drawing. The hope is that the person holding the pen loses themselves in the process of drawing and finds peace in exploring the lines. Another important tenant of Zen Tangle is that there are no mistakes. Whatever line a practitioner makes is woven in and becomes an opportunity for the piece to guide and surprise itself. Our writers described the process as both stressful and then calming. They were excited by each pattern and how each line organically brought their drawing into being. It was one of our most lively groups but in the end, everyone felt they had made and learned something entirely new. The philosophies espoused in Zen Tangle are the same as those we use in our writing. As a practice, we lose ourselves in the marks on the page, letting them guide us as much as we guide them. The piece above is a cluster of the writer’s drawings from our shared experience. 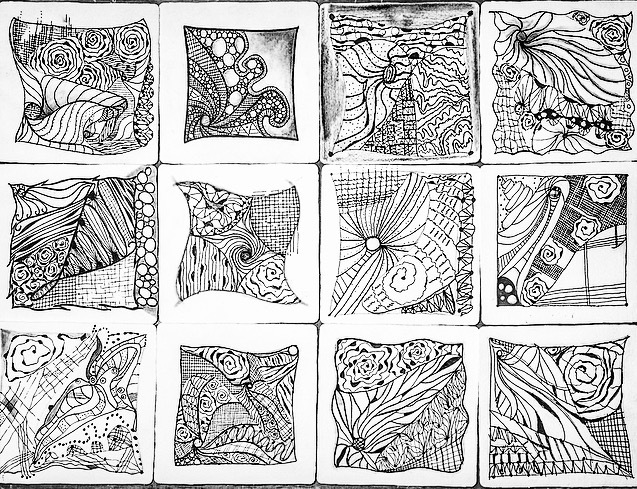 The tiles, when joined together, represent a unique moment in time and in art that we shared and each collaboratively created. We read the poem and quotes above to begin our night then lost ourselves in the tangle of lines we created, lovingly, for ourselves and each other.